The Health Commissioner immediately began an investigation into the matter and as a result, Mayor Rogers terminated the contract. Afterwards, the city built a temporary wooden fence around the cemetery, leaving it in shambles with open holes still displayed. Though numerous graves had not yet been reached and others sat exposed, a new contract for moving the bodies was never awarded. In 1894, grading and leveling began in preparation for the park, though several of the open graves wouldn’t be filled in until 1902, when shrubs were planted in many of them. The park was finally completed in 1907, without ever having moved the rest of the bodies. 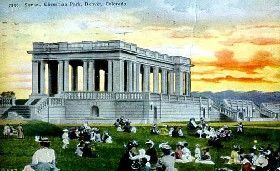 Two years later, in 1909, Gladys Cheesman-Evans, and her mother, Mrs. Walter S. Cheesman, donated a marble pavilion in memory of Denver pioneer, Walter Cheesman. The donation was conditional that part of the park’s be designated as Cheesman Park and so it was. The pavilion continues to stand today. In 1923, the bodies from the Hebrew Burial ground were removed to other sites and the cemetery returned to the city, where the site currently serves as the site of the reservoir in Congress Park. The section once used as the Chinese cemetery was used as the city tree and shrub nursery until 1930 when a WPA project converted it to an addition for Congress Park. In 1950, the Catholic Church moved the remains of those interred in the Mount Cavalry Cemetery and sold the land back to the city, which is now the location of Denver’s Botanical Gardens. The vast majority of present day Cheesman Park was mostly the Protestant portion of the old cemetery. A residential community separates Cheesman from Congress Park. Today, an estimated 2,000 bodies remain buried in Cheesman Park. It comes as no surprise that the spirits of these forgotten, looted, and sometimes desecrated bodies continue to make their presence known, not only at Cheesman Park, but in neighborhood that surrounds it. Almost immediately, when the bodies began to be removed from the cemetery in 1893, strange things began to happen. One of the first reports was when a grave digger named Jim Astor felt a ghost land upon his shoulders. Astor, who had been looting the graves as he moved the bodies, immediately ran from the graveyard and failed to return to work the next day. 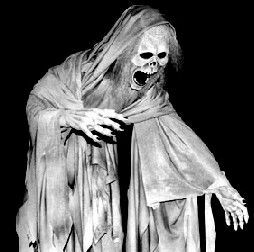 Those living in residences surrounding the graveyard began to report sad and confused looking spirits knocking at their doors and windows, as well as the sounds of moans coming from the still yet open graves. Today, these restless spirits are still said to occupy the park as dozens of tales continue to be told of paranormal activities taking place. Most visitors tell of feelings of unexplainable sadness or dread in a place, that is today, meant for pleasure and relaxation. But other reports are more specific, often including the sounds of hundreds of whispering voices and moans that continue to come from the fields where the open graves once laid. Children have been seen playing in the park during the night before they mysteriously disappear and a woman is said to be seen singing to herself, before she too, suddenly vanishes. On some moonlit nights, the outlines of the old graves can still allegedly be seen. Others have also claimed that after lying on the grass, they have found it difficult to get up, as if unseen forces are restraining them. Yet more reports tell of strange shadows and misty figures that seem to wander through through the park in confusion. Cheesman Park is located at Franklin and 8th Streets and is open from dawn until 11:00 p.m.
©Kathy Weiser – Legends of America, updated May, 2017. I live and work only blocks from the infamous Cheesman Park in Denver, Colorado and I’ve heard stories of its haunted nature but never thought much of it. Until lately. One night my friend Rubin and I decided to take a walk through the park. We walked across the south lawn to the pavilion where there were several skateboarders making jumps on the sides of the old fountain and other people walking about. We talked about work and other mundane things as we strolled away from the old pavilion to the rose gardens, where there is a natural maze of huge rose bushes. Just then I heard a rattling chain behind us and said, “Rubin, can you hear that?” As I looked around, he replied that he hadn’t heard anything. “There, I heard it again!” I exclaimed as I heard the chain jingling. Still, he didn’t hear it and we could see no one. Continuing our stroll, we moved toward the middle of the big field where it was more open and sat down in the cool grass to smoke a cigarette. Moments later we were surprised when we saw a kid riding a bicycle with a chain dangling from his pocket. Turning circles around a thin pale man, dressed in what appeared to be a shredded hospital gown covered with blood, the pair moved toward us. To say the least, we were petrified! “The ones who did this to me. They stabbed me fifteen times,” the man said. He then lifted his sleeves to show us what looked like very deep stab wounds in his arms, back, and chest. When I reassured him that if we saw “them” we would let him know, the pair casually moved away from us into the darkness. Submitted by Lee Cook, November, 2005. Lee worked at King Soopers, a supermarket near Cheesman Park and lived in an apartment right across the street from the park. He is also a musician and recording artist trying to make a living in this field part time. Lee is also fascinated with ghosts.